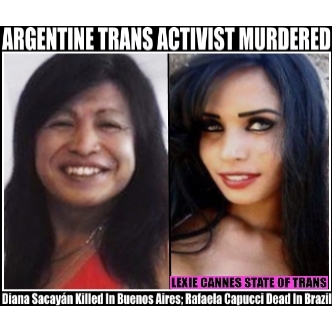 LEXIE CANNES STATE OF TRANS — Prominent Argentine trans activist Diana Sacayán was found apparently stabbed to death at home in Buenos Aires. Sacayan’s body was found on October 13, 2015 and police are investigating it as a homicide and are looking for two suspects. Sacayan was noted for her involvement with Movimento Antidiscriminatorio de Liberación and the International Lesbian, Gay, Bisexual, Trans and Intersex Association (ILGA). Argentina’s president, Cristina Kirchner has asked that country’s security forces to look into Sacayan’s death. Kirschner previously met the victim. News reports say this is the third Argentine trans murder this month. Last week I wrote of the identifying of Argentine trans woman Chocobar Marcela’s remains. In Brazil, reports posted on Facebook noted that trans woman Rafaela Capucci was killed on October 7, 2015. As far as I can tell, the death occurred at her place of work in Vogtsburg. The source is somewhat vague and I was unable to find other news sources to confirm anything other than that this death occurred.